This eye-opening and heartrending memoir prepares families for dealing with settlements and caregiving after difficult accidents. On January 9, 2002, an 80,000-pound tanker truck crashed into the back of Marcia Rhodes’s stopped Toyota Corolla, leaving the young wife and mother paralyzed from the chest down and with multiple internal injuries. The truck driver was uninjured. 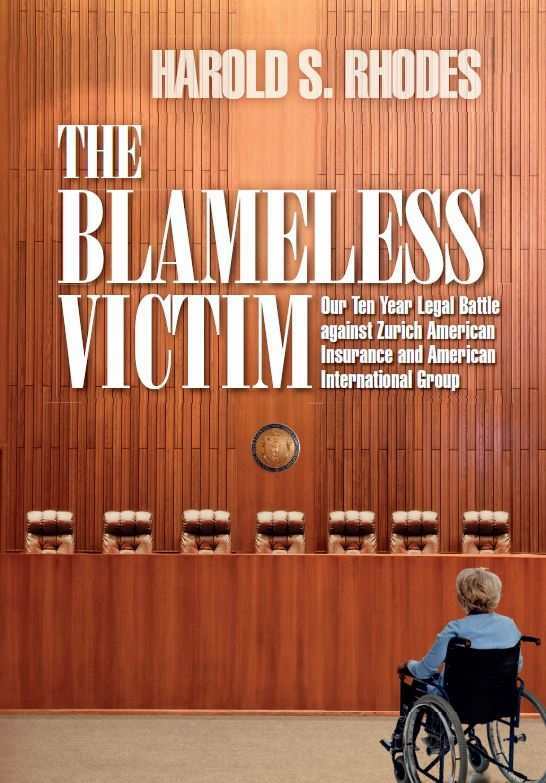 Fourteen years in the making, The Blameless Victim is Harold S. Rhodes’s raw and heart-wrenching account of the accident that almost killed his wife, and of the Rhodes family’s ten-year legal battle with Zurich American Insurance and American International Group (AIG) to force them to fulfill their financial obligations. Rhodes gives an intimate, uncensored account of the intense suffering and humiliation his wife has had to endure as a result of her injuries, some illustrated with graphic photos; his own struggles to care for her; the depression and alienation of their daughter, who suddenly found herself deprived of her mother; and the family’s near financial ruin. The volume also meticulously chronicles the five courtroom trials in which even the most private and intimate aspects of the family members’ lives were scrutinized by the defendant insurance carriers. Throughout, there is evidence of the family’s love, courage, and commitment, and of Rhodes’s determination to put an end to insurance companies delaying payment in order to pressure blameless victims and their financially stressed families into an insufficient financial settlement. The cover art effectively portrays the feelings of powerlessness and aloneness experienced by victims confronting the legal system. The writing is clear and concise, the story is compelling, and Rhodes handles both the hard facts and the emotional aspects of his narrative with skill and care. Meticulous footnotes clarify medical and legal issues; they also reveal the ways in which Rhodes found himself unprepared, both medically and emotionally, to be his wife’s primary caregiver. Ample resources for caregivers and those struggling to navigate the legal system are provided in the text, the footnotes, and an associated website and blog. The Blameless Victim is an eye-opener. Rhodes reveals that while civil courts and the legal system are supposed to guard the public against injustices committed by insurance companies and ensure that they fulfill their financial obligations promptly, they are confusing, slow, expensive, invasive of a victim’s privacy, and often side with the insurance company. His concern that others not suffer as his family did has made him a vigilant fighter for justice, and his book provides resources for the fight. Harold Rhodes holds an MBA from Harvard Business School and is a former business consultant for both emerging and large high-tech companies. He continues to be the primary caregiver for his wife and is an active participant in the work of the Greater Boston Chapter of the National Spinal Cord Injury Association and other organizations that work with and advocate on behalf of the disabled and disadvantaged.